Of course, we couldn't resist taking it apart. Wow this thing was mighty disappointing for me. I bought it for use with a Raspberry Pi Model B+ (running Jessie Lite) and I was getting nowhere there, not even lsusb. So to see if the thing even works, I plugged it into a laptop running Windows 10. When plugged in, a red LED comes on inside the device, which was encouraging. It shows up in device manager as "Broadcom 2046 Bluetooth 2.1+EDR USB Device with First Connect". However it is unable to start due to lack of a compatible driver. So I went to Broadcom's website and downloaded their WIDCOMM driver package, and that refuses to install, failing at the "verifying Bluetooth device" portion of the install. What gives? Sparkfun's teardown of this device shows it with an ASC chipset, but clearly this one is Broadcom (or, I suspect, a Chinese copy of a Broadcom chip). Anyway, it is all fail for me, on all the platforms I tried it on. Caveat emptor. FTR I also tried this on a Windows 7 computer, where seems like it is going to work, but then fails to pair with any of the three devices I tried to pair it with (a Google Nexus 7 second gen, a Moto G, and a iPhone 5S). I could have bought a $5 adapter from Amazon, or $2 from eBay, but I spent extra to buy this one from SF because I'm a long time customer and expected it to work. Save your money (and frustration) and buy something else. Anyone know if this works with a Raspberry Pi (Raspbian distro)? Was this adapter tested and worked with the IOIO board (DEV-10748)? So, I just stick this in my USB port and my cheap laptop has compatibility with off the shelf bluetooth things(especially keyboards, I really want a bluetooth keyboard)? As if it had been built in? Can you use this to connect with a sparkfun ble mate or anything similar. I am trying to make a project that consists of an arduino acting as an interface between the user and my computer, I wanted to make it bluetooth. Any help would be great. Hi, any BLE dongle option which works with RPi? maybe retro-compatible with older bluetooth stack? Thank you! Can a fellow Linux user help me out and do a 'lsusb' with this device plugged in, and post back here with the results? That should hopefully tell me which chipset this device uses; I'm hoping it uses the Cambridge Silicon chipset which is known to work very well with Raspberry Pi. Thanks! I just got one of these and in a panic to get it working uninstalled the drivers from it. Anyone here know a way to re-install its drivers? it is just showing up as an "other device"
Does any one know if this bluetooth is pairable with the BlueSMiRF Silver; That is, is it bluesmirf discoverable by the this device? Doesn't seem to work. Can these be configured to emulate a serial port on Win XP and / or Vista? I'm looking to communicate with Android and Bluetooth Mate Silver as serial comms. Any advice on how to set this up and a good serial comm program for XP / Vista. Also any input on a strait Bluetooth communication terminal? Ultamate goal is bi directional communication between Android and Micro device. I know IOIO would do this but I prefer to leave IOIO OUT of the picture as this might become a production product and I don't need to complicate matters by requiring customers install IOIO product on their phone. Did anybody tried using it with IOIO for Android? I bought this specifically for my IOIO as it was listed as a related item. It does NOT work for me with Droid Incredible. Hardware v SPRK0016, Bootloader vIOIO0301, App vIOIO0324, IOIOLib vIOIO0324. It is recognized in my PC, however. If anyone has any tips on how to make it work, it would be appreciated. Yes, it works just fine with IOIO. Which version did you use ? I could not get it to work with the ioio board. I have multiple ioio boards and multiple copies of this dongle. None of the ioio boards seemed to work with any of the bluetooth dongles. I bought a different dongle and the different module worked flawlessly with all of my ioio boards. We also cannot get these dongles to work with the IOIO boards (and Nexus 7 tablets). The tablets report a "communication error". Other dongles work fine. Which dongles are you using ? I am a little confused about the whole dongle thing. I get that these are basically transmitters but can they function as receivers? And couldn't this be connected to a Arduino with the USB host shield? This is a standard bluetooth module, which supports both TX and RX, just like the internal bluetooth in a newer laptop. And couldnât this be connected to a Arduino with the USB host shield? 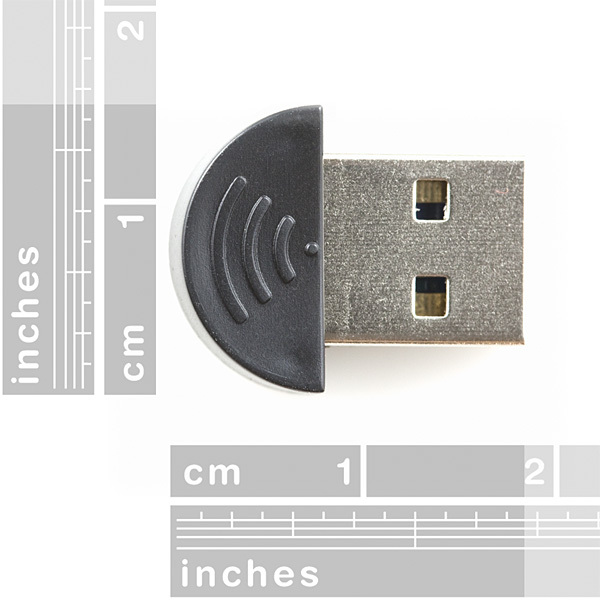 Yes, this dongle is a USB device (vs. host). So with the proper firmware, you can communicate via USB host shield and Arduino. I just got the module. I want to access the module from the PC by a programming language (say Visual Basic) using AT command. I have SparkFun Bluetooth module BTM-182 and I want to communicate with it by PC using this mini USB module. Can any one have any idea how to do that? I've plugged this in to 3 different laptops, (2 Windows 7, and 1 Vista) and I can't seem to get the module to be recognized on the Win7 laptops. any suggestions ? would this recognize something like the bluesmirf? I bought 10 of these dongles recently although after looking at the "taking it apart" section my circuit layout is different probably a different version however the same problems exist with the BD address :( Even have some problems when using these dongles on two seperate computers when scanning for devices since the local and remote BD address is the same sometime it returns with a n/a for the name since it cant tell the local and remote devices apart. Nothing but trouble with these dongles :/ guess I will need to order 10 of a different brand. I guess alright for ppl who only want to use one dongle but WTH how can they produce these things they are not good in real world situations and being close to someone else with one of these devices is sure to cause problems. I'm sorry to hear you are having issues with this. Contact techsupport at sparkfun dot com and we can help you out. 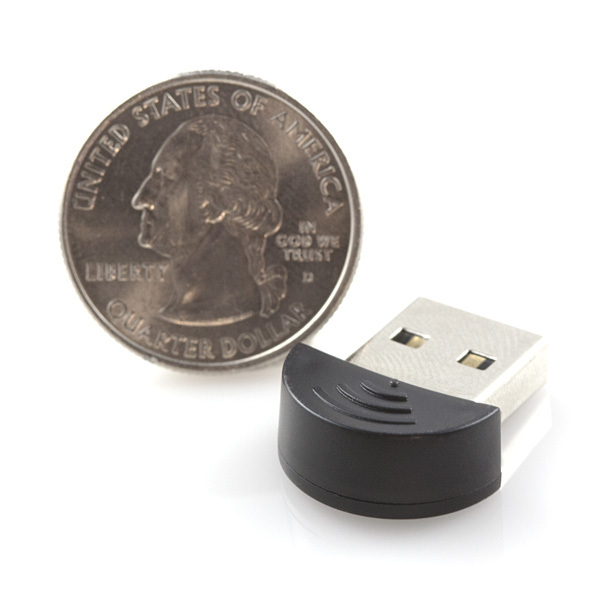 I have a newbie's question: if all I want is to connect such a dongle to a battery, and write an app for a mobile phone that'll try to connect to it through bluetooth - will this product do the trick? I don't need to pass any data. Just to get a connection and know it's there. This wont work because the HCI (Host Controller Interface) must be used to bring the adapter to the Running state. On top of that the device wont be discoverable unless put into inquiry scan mode which must be done through the HCI. 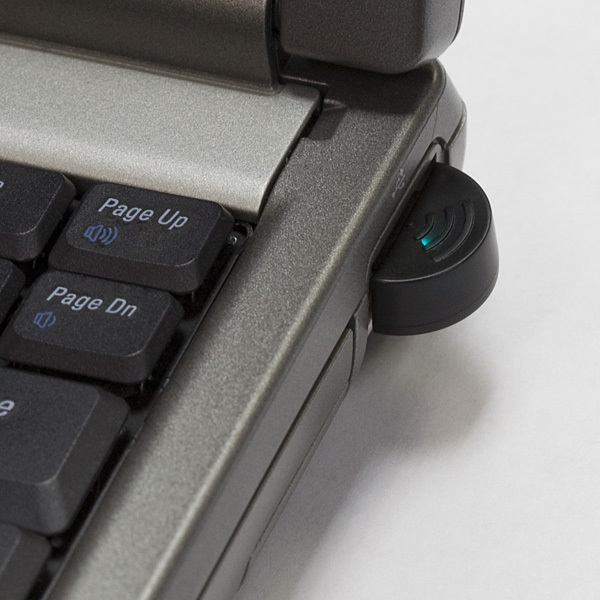 The HCI is the physical connection between a bluetooth device and a computer hosting it so without a connection to a computer of some sort a bluetooth adapter can't be put into the correct modes to be discoverable. The only possible way to do this would be to rewrite the firmware for the device to make the default settings the ones needed then re-flash the chip on the adapter. Does anyone got the same problem ? I'm interested in connecting a remote terminal to linux using a bluesmirf on the remote serial terminal, and one of these at the PC end. Does anyone have, or can point me to, directions for how to set up a bluetooth serial link using this at the linux PC end? I have tried searching and gotten nowhere. I'm no linux expert. "If you're attempting to attach multiple modules to a computer, the computer will not be able to address both modules at the same time." ...means that if I have 2 IMUs with a bluetooth transmitter the computer will ONLY be able to see one of the set of data? I need 2 IMU to send its output via wireless to a PC. when i plug it into my computer, it says "USB Device not recognized". i went into the device manager to try to install a driver and it says the best driver for the device is already installed. anyone have any suggestions? What kind of power draw does this have? I'm trying to build a power budget for a battery-powered system and I don't see any sort of specs on it. We don't have this information and it will vary greatly on several factors. Contact techsupport@sparkfun.com if you have further questions. Works like crap for me. Doesn't see half the stuff my roving networks module does, half the time it can't find anything, even when there is a bluetooth device sitting within a few feet of it. Will this work with Mac OS X? How difficult would it be to attach this to an atmega32? I've seen many projects with use USB to connect to the mega32, however, it has occurred to me that it is probably much more complex it make the thing function as a host controller, rather than just a node. In regard to using this product with the NXT, has anybody had a successful connection? If not, can somebody running Windows 7 that has this product please go to "Devices and Printers" in the Start Menu and tell me what this bluetooth module appears as? Given some past experience with the NXT, the blue Abe Dongle specifically advertised to interface with the NXT is a CSR Radio, and I believe that other bluetooth devices with this specification will also work. 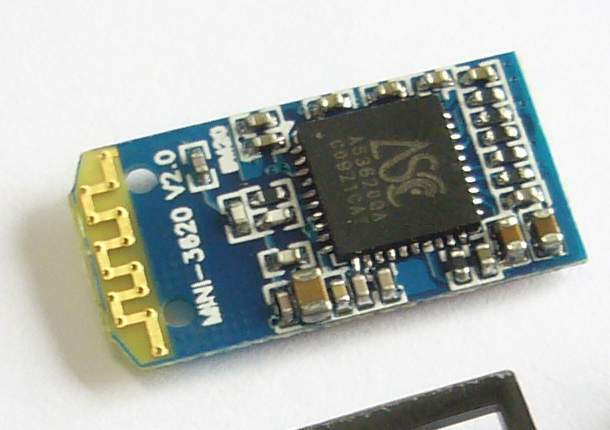 It appears as something along the lines of "Bluetooth CSR Radio" and its icon is a usb dongle with a blue led about 3/4 of the way down the top of the module. Looking at the take apart photos it appears to be an ASC chip. What that means for compatibility I don't know. 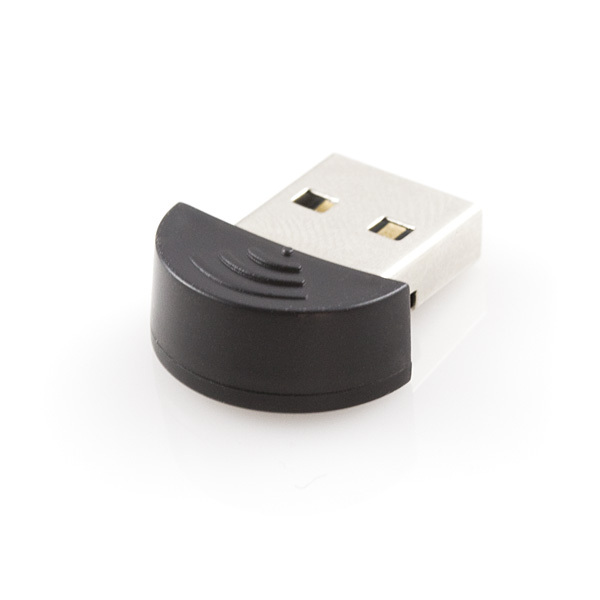 Could you plug this dongle into the usb port on an arduino duemilanove (using a usb b to a adapter) and use it to get the arduino to talk to a bluetooth enabled computer? i wish i could. if someone really wanted to they could make it work. Never mind. I found an answer on the arduino forums. This would not work because the arduino doesn't act as a usb host controller. This is true. That USB port is specifically for interfacing with a computer to upload code to the Arduino and act as a serial monitor. Why doesn't anyone ever tell if these things (usb bluetooth) work for linux. very likely it will. I have several bluetooth dongles (even another brand mini) and they all work with the bluez tools. I have bought three of these between home and work (two different accounts) in the last two weeks. Of the three, TWO FAILED out of the box. Based on customer comments, I'm not the only one to fall prey to these crappy little devices. Also, considering that support didn't even blink or ask for the small piece of plastic back, but offered an immediate refund, Sparkfun is aware of how poor these products are. I spend a lot of money at Sparkfun between personal life and work. I find it discouraging that for several years there are poor and bad comments about this product, and yet Sparkfun continues to sell it. Perhaps management should reconsider offering this unreliable device. This was easy to program for use as serial data transfer from an Arduino to a PC. It was also easy to pair with a cell phone for data transfer. I wish it were faster as it took me about 70 seconds per photo to transfer, but I won't complain about speed when the price is so low.